Liam Green as Uncle Drosselmeyer with Carina Roberts as Clara in The Nutcracker. Photo: Sergey Pevnev. First performed in 2016, West Australian Ballet’s Nutcracker is choreographed by Jayne Smeulders, Sandy Delasalle and Aurélien Scannella, and based on the 1892 St Petersburg production created by Marius Petipa and Lev Ivanov. Tchaikovsky’s now universally admired score was commissioned for that production. With two acts and a prologue, events take place on Christmas Eve. The setting for WAB’s Nutcracker is established on entering the auditorium. The audience sees the beautifully painted front cloth with “1830 London” written across the sky in large whirls of smoke emitting from a chimney pot on the roof of a snow-capped building, with iconic historic London landmarks visible in the distance. On opening night under the baton of Myron Romanul, Tchaikovsky's memorable score was well-played by West Australian Philharmonic Orchestra despite some minor intonation issues. Lit by Jon Buswell, eye-catching sets and costumes (designed by UK pair Phil R. Daniels and Charles Cusick Smith) include several beautifully detailed, painted, printed front and backcloths, creating an elegant drawing room interior, a magical Christmas tree, a wintry wonderland, the Land of Sweets and a Candy Castle. 147 lavish, intricately designed costumes complete the visual feast. The ballet begins with Uncle Drosselmeyer (Liam Green) – an unconventional dresser in a multi-coloured cape and black top hat with an illuminated off-kilter clock-faced lid – in his workshop applying the finishing touches to the costumed, magical toy dolls he is taking to the Stahlbaum Christmas party, including a Nutcracker doll for his niece Clara. Rugged up families hastening through snowy streets, carrying gifts, create lovely images as excited children throw snowballs on their way to the festivities. The ensuing celebratory party scenes maintain momentum effectively, with children and adults mingling together in sections of the group dances, Clara (Carina Roberts) and Fritz’s (Matthew Edwardson) lively antics and sibling spats, and also Drosselmeyer’s miniature theatre of costumed dolls and magical feats. After the guests depart, Drosselmeyer’s wizardry begins in earnest. To Clara’s amazement the Christmas tree grows, a comic but rather too lengthy battle between King Rat’s army and toy soldiers occurs, and her beloved Nutcracker doll comes to life as a Nutcracker Prince (Matthew Lehmann). Drosselmeyer transports them by sleigh to a wintry land to join twelve silvery snowflakes and their Snow Queen (Claire Voss), who dance with flurried, darting movements, capturing the chilliness of the brightly-lit glacial land as snow falls. Act II begins as Drosselmeyer continues Clara and the Nutcracker Prince’s journey in the sleigh to the Land of Sweets to meet the Sugar Plum Fairy and a festival in Clara’s honour follows. 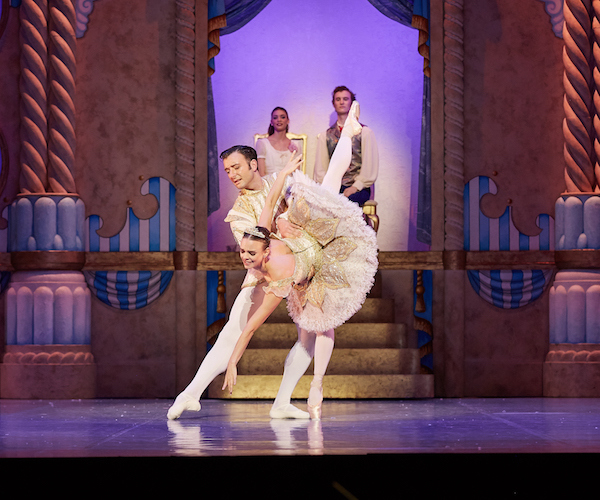 Matthew Lehmann (Nutcracker Prince) and Claire Voss (Sugar Plum Fairy) in The Nutcracker. Photo: Sergey Pevnev. 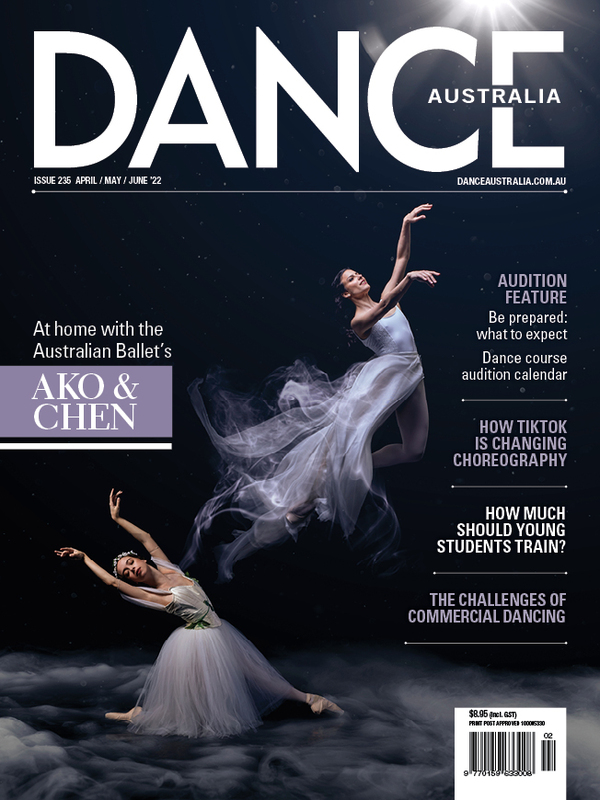 Dancers who caught the eye included Chihiro Nomura, Nikki Blain, Stefano Russiello, (Mirlitons) and also Polly Hilton, Jesse Holmes, Christian Luck and Cyprien Bouvier (Spanish), Ludovico Di Ubaldo, Phebe Sleman, Alexa Tuzil, Ana Gallardo Lobaina (Arabian), and Adam Alzaim (Trepak). The formal patterns of the Waltz of the Flowers were visually beautiful and very well-danced. However issues of cultural stereotyping in the “treats from many lands” divertissement remain. Carina Roberts again delighted with her secure, rock-solid technique, virtuosity and assured stage presence. Versatile Matthew Lehmann danced with charm and style, with clean, light landings in impressive tours and jumps in a beautifully performed solo, consummate partnering and command of the stage throughout. Liam Green was an extremely youthful-looking Uncle Drosselmeyer, and excelled in all aspects of the role, dancing, performing magic tricks and partnering. Corps de ballet member Claire Voss, cast in the challenging dual roles of Snow Queen and Sugar Plum Fairy, let her nerves get the better of her at times, but with Lehmann’s re-assuring assistance, conquered the slow tempo of the grand pas de deux and performed the Sugar Plum variation very well. Though the company gave a commendable performance overall, opening night didn't quite match its usual heady standards due, perhaps, to recent injuries resulting in last minute cast changes. The capacity crowd got into the early Christmas spirit, however, and loved it all. Pictured top: Liam Green as Uncle Drosselmeyer with Carina Roberts as Clara in 'The Nutcracker'. Photo: Sergey Pevnev.